The progression that computers made from IBM to your laptop has patterned the expectations for all future technologies. First, big companies create and use a very expensive set of technologies. Then, garage tinkerers start to use slightly cheaper, smaller versions of the original technology. They create a culture that makes the technology easier to use and they give it more users, which drives down its costs. Finally, when it is sufficiently cheap and easy to use, mass market consumers start to buy it. This is a condensed, reductive history of consumer electronics, but it’s the mental model Silicon Valley-types have. The latest technology that seems to be working its way along this trajectory is 3D printing. For those not in the MAKE crowd, 3D Printers are machines that produce three-dimensional objects from digital data by printing in thin layers of physical material, similar to the way an inkjet prints in two dimensions. A 3D printer outputs not words on paper, but a thing. After a couple decades of research, development, and industrial deployment, the technology appears to be on the threshold of developing a mass market. Still, it’s hard to imagine what to do with such a general purpose machine sitting in one’s house. And that’s what makes Brendan Dawes such an interesting early adopter. For one, he’s kept meticulous records of his productions since he bought his MakerBot Thing-O-Matic from Makerbot Industries, a company that sells stripped down do-it-yourself 3D printers directly to consumers, in December 2010. 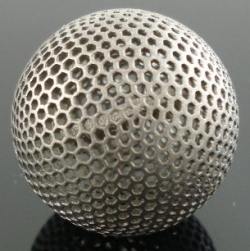 Over the past year he has posted his "printings" on a tumblr called everythingimakewithmymakerbot. The site reads like a diary or sketchbook; an intimate account of a creative person interacting with a new technology.